I used lots of yellow/blue/white flowers from 49 and Market. I love their flowers, since many of them come with greenery as well. 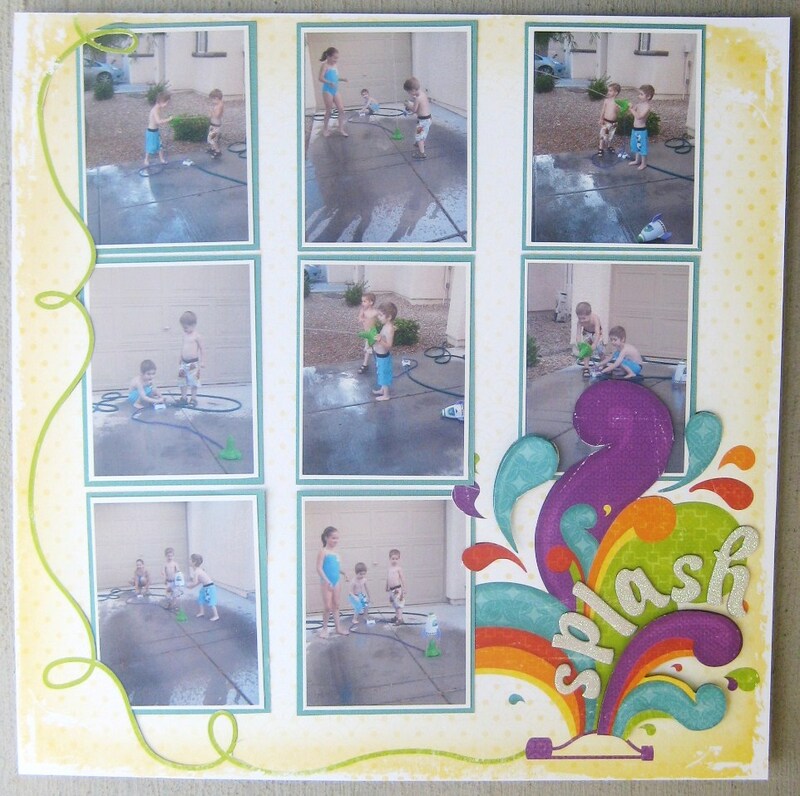 I have these, along with lots of other premade scrapbook pages, available in my eBay shop. Please let me know if there are other collections or products you’d like to see highlighted in future blog posts. Thanks so much for stopping by! 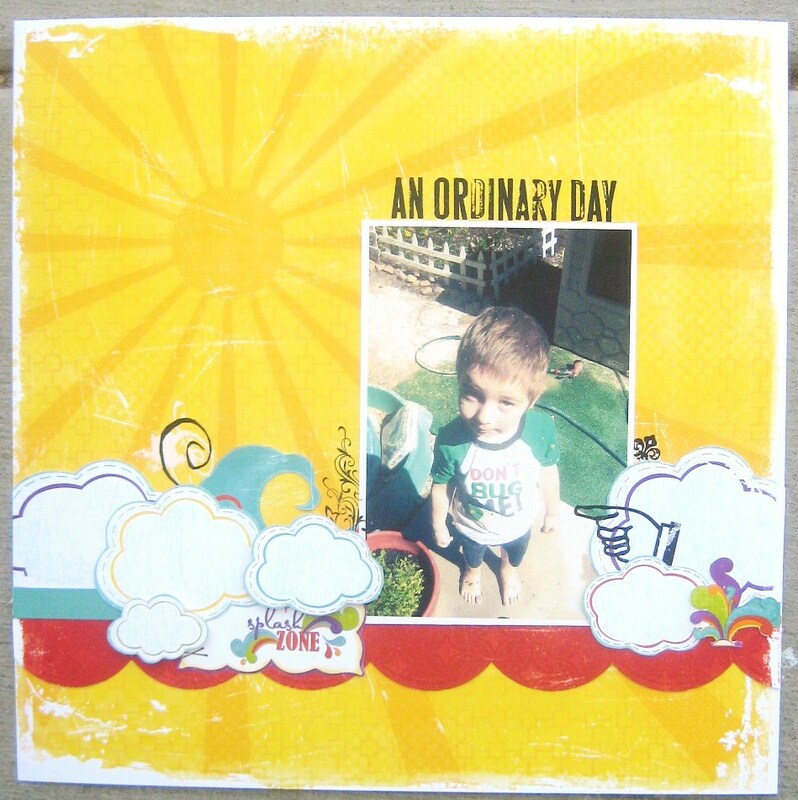 Watercolor and stencil backgrounds are my new favorite way to design scrapbook layouts. I love the versatility, and the fact that every time turns out a little bit different. I also added some stencil and stamping ink for the polka dots. 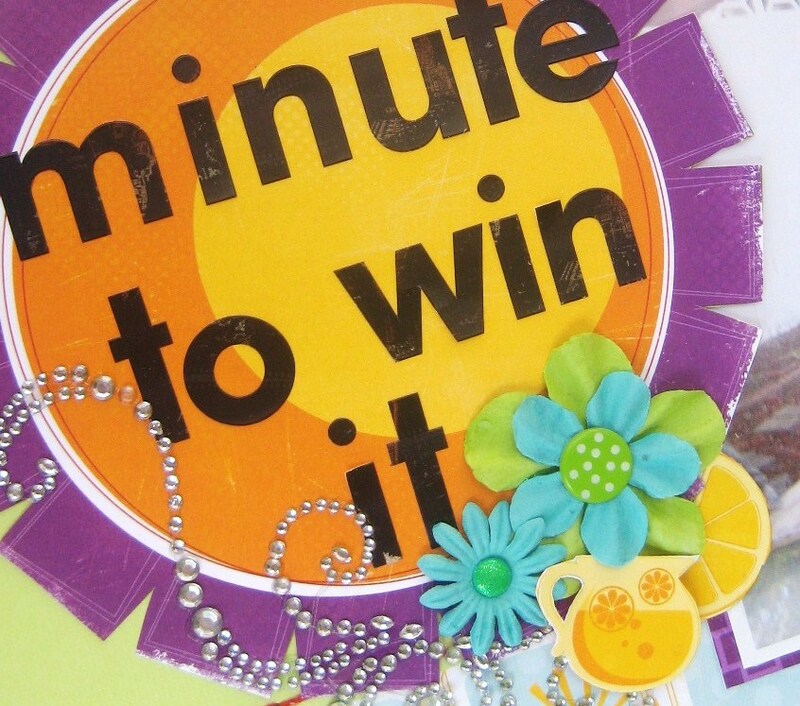 The page pops with the bold, bright colors of these Prima Marketing flowers. I love the sherbet shades of oranges and corals in the Paradisia collection. My sister gave me a package of foil transfer from Prima Marketing, and it’s been in my drawer for about…a year. I just didn’t know what it was or how to use it. Cut to – I had a custom request for some Pink Floyd scrapbook pages. I knew I would have to make my own background papers for something like this, and -BAM!- the package of foil was opened. I have to say, it’s pretty magical. And SUUUUUUUUUUUUPER easy to use. For my layouts, I decided to use spray adhesive and stencils. I sprayed the adhesive through the stencil onto my card stock and when it was *almost* dry, stuck the foil paper (shiny side up) onto it (I also gave it a hardy rub, just in case) and… instant glam! I have used several packs since. They work so well on black paper, and I can’t seem to get such magnificent color and shine with any other embellishment. You can purchase some here, if you want to give it a go. Prima Marketing carries them in several shades, but this is the package I used for these pages. Try ’em out, and let me know how they worked! I would love to see pictures of your finished projects! Happy crafting, and shine on! Ok. This is my new favorite way to scrapbook. I remember watching several YouTube videos about Lindy’s Gang shakers and I thinking, “THAT is how all these cool mixed media pages look like that. Holy smokes.” (that was my actual interior dialogue). And my life has changed forever. Literally just shake them onto your paper and spray with water. I didn’t even need a paintbrush. For the bright purple color in the first layout, I also added Dylusions ink sprays to make the color bolder. I found that if the paper was wet enough, they blended really well with the powder pinks from Lindy’s Gang. Hope these pages inspire you to get messy! Please let me know if you’d like a video tutorial as well. I’m super excited about my new-found artistry! I recently made this birthday card for a very special 4-yr-old. I thought the image looked just like her, so I was excited to make this unique greeting for her. I went a little Stickles crazy here and then embellished the card with tons of flowers and rhinestones. The scalloped ovals and swirls in the corners are from the Storybook Cricut cartridge. The picture really captured the season for me. I can’t count how many times Jackson has “helped” water the plants, only to come to the door covered in mud and soaking wet! Jack and his cousin had a “blast” with the Buzz Lightyear rocket water toy. Again, Bo Bunny was the perfect fit! The paper really lends itself to cutting out sections and layering. 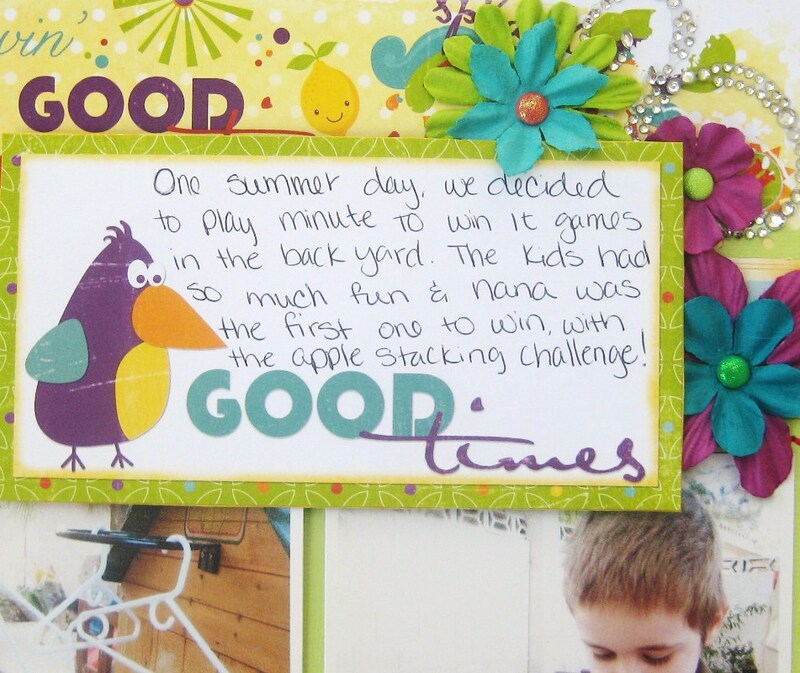 Another fun summer memory has been the day we played Minute to Win It games in Nana’s backyard. We had SO much fun and I cannot remember the last time I laughed so hard! My mom was the first person to win a game (apple stacking). This picture is worth a thousand words ~ it’s one of my favorite images of her. 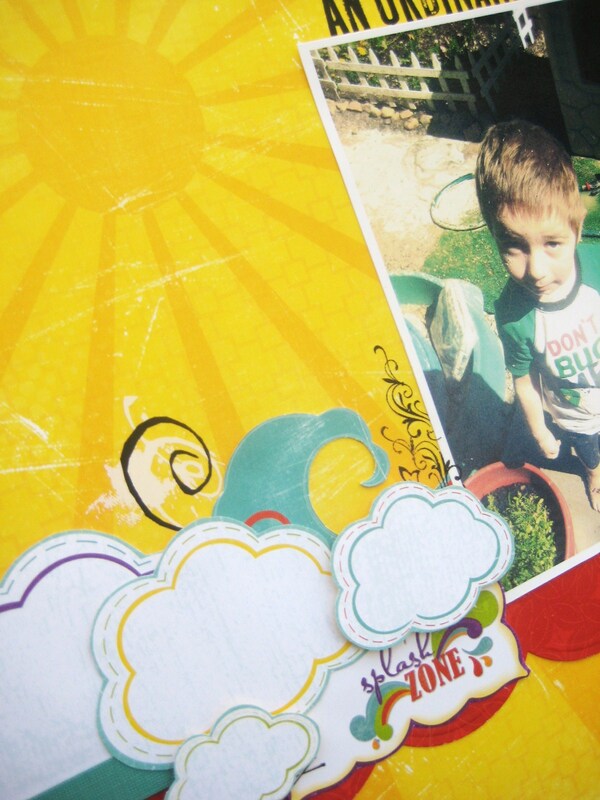 I’ve also started cutting and layering the Bo Bunny Sun Kissed line for my summer cards. 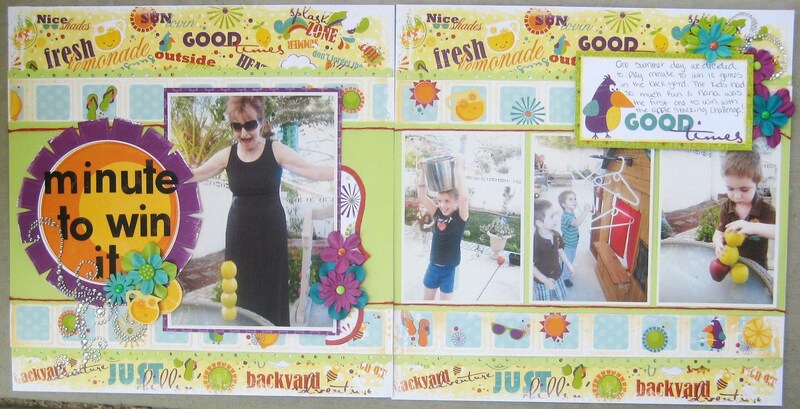 I had lots of fun with this collage greeting. I used a kitschy pin-up and added her to the Bo Bunny banner journaling square. 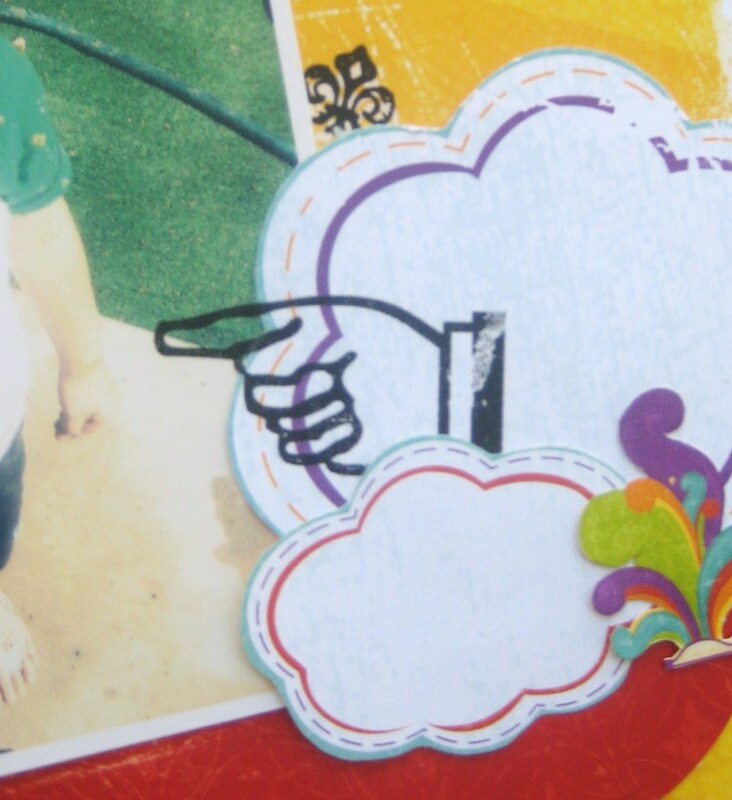 Then, I inked some orange onto the card and added some 3D clouds. Hope you’ve enjoyed this week’s projects! Enjoy and have a colorful summer! Every once in awhile, I get into a paper piecing state of mind. I love the unique look that it gives and the flexibility it offers. Here is a fun owl card that was made using brown and green embossed Bazzill card stock. It works so well with the Cosmo Cricket tree paper too! 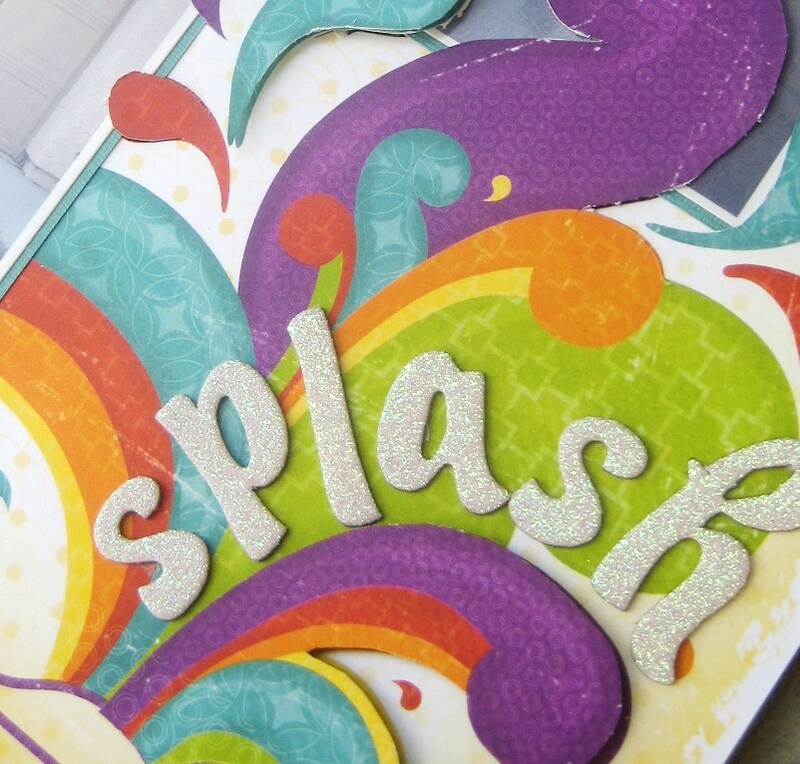 My die-cutter of choice when paper piecing is the Sizzix. It’s nice to utilize a tiny piece of paper and to be able to cut through multiple layers at a time. I also enjoy finding other crafters that can make one-of-a-kind paper piecing embellishments for me! This special Alice in Wonderland card was made using the handmade die-cut from another Etsy selller, Kott Kreations. This unique embellishment is completely pieced and penned by hand. I wouldn’t have had the time (or patience…or know-how) to do it myself. This can be a little more expensive than doing it yourself, but it’s a nice treat once in awhile and makes for an AMAZING card! Here is another card in which I enlisted the help of a fellow Etsy crafter to make the paper pieced die-cut for me. This darling owl was handmade by Lisa’s Handmade Cards. Her listing just grabbed me one night and I thought of all the potential in this terrific embellishment! Whether you make it yourself, or seek out the help of “professionals”, consider experimenting with paper piecing. There are so many unique crafting possibilities in your future!